Rawalpindi, 17 March (AKI/DAWN) – A suicide bomber hit a crowded bus-stop in the northeastern Pakistani city of Rawalpindi late on Monday, killing at least 11 people and injuring more than 25 others. No group has immediately claimed responsibility for the attack. A woman and a child were among those killed and political workers, pedestrians and passengers were injured. Three of the injured were in critical condition. Body parts were reportedly strewn across the scene, making identification of the victims difficult. According to witnesses, a man exploded himself after getting out of a vehicle parked near a crowed wagon and several other vehicles at around 9:15 pm local time. The blast damaged at least eight vehicles, several shops, a restaurant and nearby buildings. Malik Iftikhar, who was injured in the blast, told Pakistani daily Dawn that he was sitting in a restaurant when the explosion took place. Chaos and panic ensued, he said. He fell on the ground and the restaurant was filled with smoke. The area was littered with human flesh and glass shards. Rawalpindi regional police officer Nasir Khan Durrani said the blast had not left any crater. “It was an act of terrorism, apparently a suicide attack. The motive was to spread panic,” he said. Durrani said the entire country faced a terrorist threat. According to bomb disposal experts, seven to 10 kilogrammes of explosives had been used in the attack. The bombing was the first terrorist attack targeting the general public in Rawalpindi since 2002. The attack came after a day of high political drama, in which Pakistan, in which, under alleged pressure from the United States, president Asif Ali Zardari reinstated sacked former chief justice Iftikhar Chaudhry and promised to allow Pakistan’s opposition leader Nawaz Sharif to return to elected office. Security sources said the bomber might have originally planned to sabotage protests by lawyers aimed at restoring Chaudhry and other top judges sacked by former president Pervez Musharraf. After failing to do so, the bomber may have decided to target a crowded area instead, the sources said. Agartala: Four back-to-back terror strikes in Agartala, the capital of Tripura, which shares a 856-km porous border with Bangladesh, on Wednesday evening left at least four people dead and 76 others injured, several critically, according to hospital sources. The state police confirmed only one death but said the toll was likely to rise. The first explosion took place around 7.30 pm at Radhanagar bus stand. Minutes later, there was another blast at Maharajganj Bazar in the heart of the city. The two are about 2km apart. Two live bombs were found at Motor Stand and Colonel Choumohany near the palace compound. As the injured were being taken to Agartala Government Medical College hospital, another blast rocked GB Bazar, which is on the route of the ambulances taking the injured to the hospital. 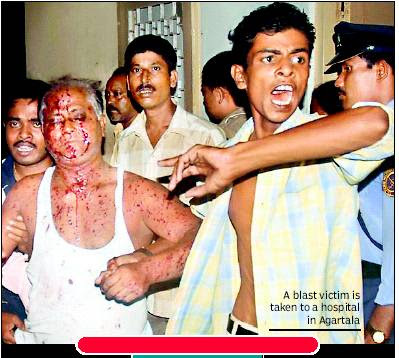 The fourth blast at 8.15 pm was near Kathiababa Ashram on the outskirts of the state capital. There was a heavy rush of puja shoppers at Radhanagar bus stand, Maharajganj Bazar and GB market, all in the heart of the city. While Tripura has long been a conduit for smuggling and terror merchandise, most violence in the state had been related to insurgencies of tribal groups. But the blasts on Wednesday, security officials said, were likely to be the work of the Bangladesh-based Harkat ul-Jihad-e-Islami (HuJI), a terror group which has been frequently blamed for terror attacks in UP and Hyderabad. Investigators are still probing the possible connection between HuJI and Indian Mujahideen, the SIMI splinter group, which has claimed responsibility for serial blasts in Bangalore, Ahmedabad and Delhi in recent weeks. 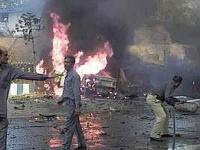 As in Ahmedabad, Jaipur and Delhi, the news of the blasts triggered citywide panic. All telecommunication links were jammed, with people calling to check if their family and friends were safe. Quoting witnesses, police sources said two persons riding a motorcycle were seen moving suspiciously at Radhanagar bus stand. The blast took place there two to three minutes after they left the place. Tripura police chief Pranay Sahay rushed to the sites to monitor the evacuation but refused to go on record on possible suspects. Agartala: In recent weeks, there have been reports of Islamic militants using Tripura to enter India from Bangladesh. Reports also said that on September 25, central intelligence agencies had warned north-eastern states of an impending terror attack and Border Security Force officials in Agartala confirmed having received the input. Meanwhile, Army sources from Kolkata suspect that Islamic fundamentalists in Bangladesh used National Liberation Front of Tripura (Biswamohan) in carrying out the serial explosions . Another army source said one of the unexploded bombs found at the Motor Stand had been kept in a tiffin box. As a safety measure, the police exploded it before the arrival of forensic experts. The forensic would now go into the details of the nature of the explosives.